Lew Temple (born October 2, 1967) is an American film actor, known for his roles as Locus Fender in the action film, Domino, Cal, the diner manager in the comedy-drama Waitress, and Axel in the third season of The Walking Dead. Temple was raised in Texas. He was the 1982 Baseball MVP at Rollins College, and graduated in 1985. Though he was too small for the big leagues, he continued with his love for baseball, snagging roles as a minor league bullpen catcher for the Seattle Mariners and Houston Astros. In 1986, he was a scout for the New York Mets, and would later go on to serve as Assistant Director of Minor League Operations and Scouting for the Astros until 1993. Temple has had several film roles in the horror genre, appearing in Rob Zombie's horror film, The Devils Rejects as Adam Banjo, portraying Sheriff Winston in the prequel to the remake of The Texas Chain Saw Massacre and as Noel Kluggs in Rob Zombie's slasher film, Halloween. Temple played Marv in Trailer Park of Terror, and Pete in the thriller/horror film House. In 2016 he starred in Rob Zombie Slasher film 31 as Psycho-Head. Temple's other film roles include Locus Fender in the action film Domino, a paramedic in the crime thriller Déjà Vu, Cal, the diner manager in the comedy-drama Waitress, Brian LaRue in a proof of concept for the science-fiction film The Three, Ned in the thriller Unstoppable and Montgomery Blair, a member of Abraham Lincoln's Cabinet, in the movie Saving Lincoln, which tells the President's story through the eyes of Ward Hill Lamon, a former law partner, friend, and primary bodyguard. Temple appeared in an episode of CSI: Miami as Billy Chadwick, a local loner in a grizzly bear murder case. In 2010, he appeared in an episode of NCIS: Los Angeles as Mr. Loobertz, and in 2011 he appeared in an episode of Criminal Minds, in which he played a former fisherman turned part-time deliveryman called Bill Thomas. His most notable television role was on The Walking Dead as Axel, a prisoner survivor of the zombie apocalypse. In 2002, Temple was let go from a movie contract because he dismissed symptoms of a serious illness. A near-death experience resulted in an examination at M.D. Anderson Hospital in Houston, where he was diagnosed with a rare form of leukemia and a forty percent chance of survival. He stayed in the hospital for eight months and underwent for chemotherapy treatment. He is a leukemia survivor. In 2009, Temple was involved in a charity event for breast cancer called Bowling for Boobies. Walker, Texas Ranger Whit Ganz Episode: "Miracle at Middle Creek"
1997 Walker, Texas Ranger Nick Devlin Episode: "Full Contact"
The Big Easy Nash Lee Episode: "A Streetcar with Desire"
Walker, Texas Ranger Louie Episode: "On the Border"
2001 Walker, Texas Ranger Ollie Olmedo Episode: "Saturday Night"
2007 CSI: Miami Billy Chadwick Episode: "A Grizzly Murder"
2010 NCIS: Los Angeles Mr. Loobertz Episode: "Full Throttle"
2011 Criminal Minds Bill Thomas Episode: "Coda"
2012 Hawaii Five-0 Stuart Rizzi Episode: "Kahu"
2015 Review Shovel Hitter Episode: "Buried Alive, 6 Star Review, Public Speaking"
^ "Artist / VIP Gallery: LEW TEMPLE". Polish Film Festival, Los Angeles. Retrieved October 21, 2010. ^ "Tradition: ROLLINS BASEBALL MOST VALUABLE PLAYER". Rollins College Athletics. Archived from the original on July 15, 2011. Retrieved October 21, 2010. ^ a b c "Boyd Coffie (1898-1948): Dean of the College". Olin Library, Rollins College. Archived from the original on July 20, 2011. Retrieved October 21, 2010. ^ "1986 New York Mets: Roster". The Baseball Cube. Retrieved October 21, 2010. ^ "TRANSACTIONS: Baseball American League". New York Times. November 10, 1993. Retrieved October 21, 2010. ^ a b "Lew Temple interview (Rango, Unstoppable, Devil Rejects) – The Desk of Brian". deskofbrian.com. Retrieved 8 October 2016. ^ Three More Join Rob Zombie’s ’31′, Including Sheri Moon Zombie! 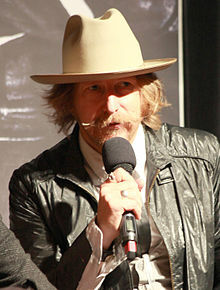 ^ "Lew Temple (a.k.a. Axel) talks about the latest 'Walking Dead' shocker -- EXCLUSIVE". www.ew.com. Retrieved 21 September 2016. ^ "Exclusive: Lew Temple talks The Walking Dead Episode 310 "Home"". dailydead.com. Retrieved 22 September 2016. ^ "the-walking-dead-actor-lew-temple-receives-lifetime-achievement-award-at-local-film-festival/". uhclthesignal.com. Retrieved 8 October 2016. ^ Bowling for Boobies: Dread Central’s Horror Starlets Wish to Thank You! Ross, Dalton. "Lew Temple (a.k.a. Axel) talks about the latest 'Walking Dead' shocker". Entertainment Weekly. Retrieved 17 February 2013.